Because cabinets are such prominent features in your kitchen and bath, the finish you choose for them affects the whole ambiance of the room. 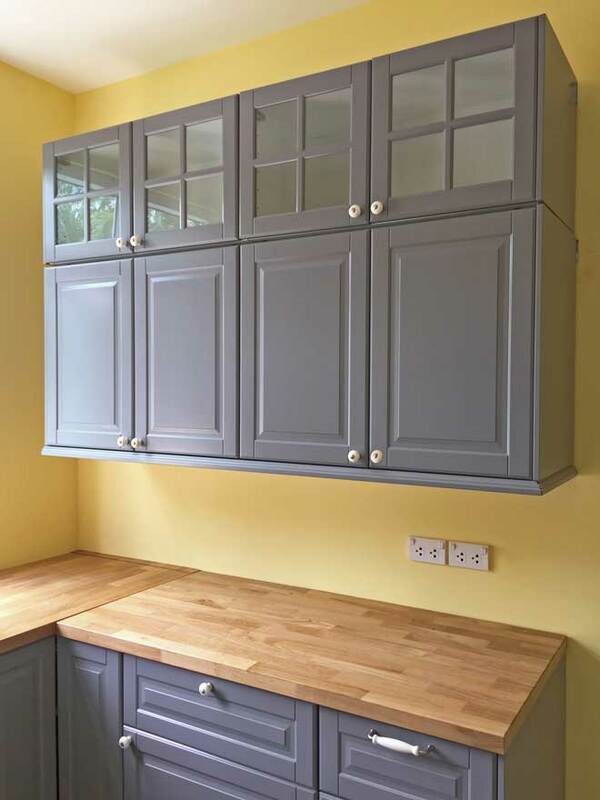 While both painted and stained cabinets can be equally attractive, each finish has aspects that make it better suited to some situations than others. Paint opens up a world of color choices and lets you create a fresh, contemporary look. You’ll get especially good results if your cabinets are MDF or wood with a fine, indistinct grain, such as maple. Because paint is thicker than stain, it provides more complete coverage of wood grain, knot holes, and natural color variations between each cabinet. You’ll get cabinets with even, consistent coloring and a sleek look that’s perfect for modern decor styles. Paint is also a fitting choice for classic retro-style kitchens, with their blue or white cabinets, and for the white cabinets popular in farmhouse-style kitchens. The flip side of this is that paint hides the features that give wood its character. 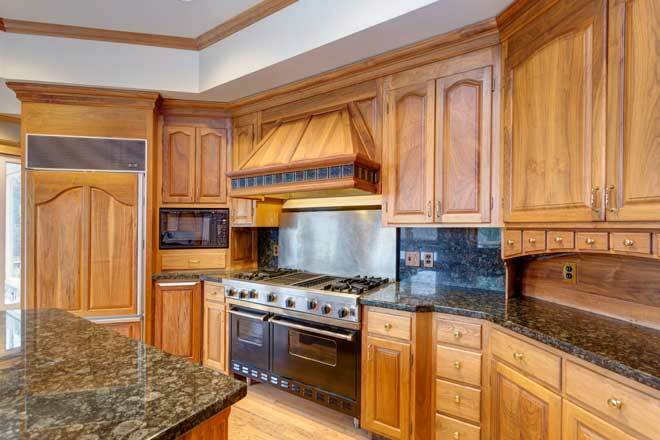 Expensive wood cabinets will lose much of their distinctive, luxury appeal. On the other hand, paint can’t always create a flawless surface on woods with a prominent grain, such as oak, ash, and hickory. Stain limits your color options to something that’s more or less a natural shade of wood. With paint, your choices are nearly unlimited. You’ll have more ways to express your sense of style and more control over the ambiance you create in the room. You can have cherry red or lemon yellow cabinets that give the room a cheerful, sunny feel or paint your cabinets charcoal grey or indigo for a moody atmosphere. Uncommon colors, such as Merlot red or olive green, bring a unique character to the room. While you can stain MDF (medium-density fiberboard) cabinets, the result won’t look as good as stained wood. Stain works so well on wood because it brings out the wood’s natural features, in particular the grain. Because MDF doesn’t have grain, stain results in a largely flat, brown surface with minimal color variations to add interest. Paint, however, covers MDF beautifully. Even white and pale cream shades can make inexpensive MDF cabinets look almost identical to pricey wood models. 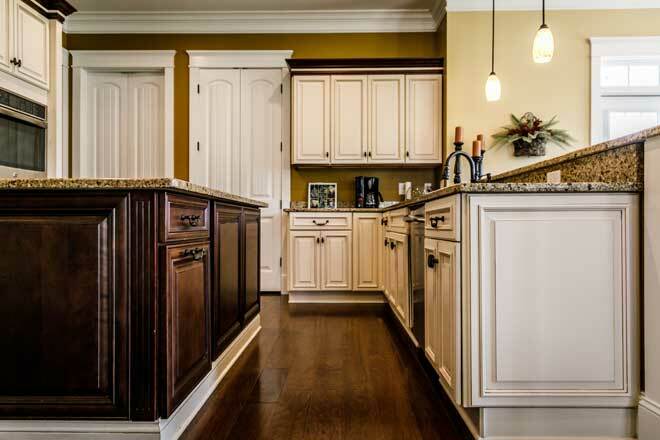 The classic finish for wood cabinets, stain lets the natural variations in wood shine through. Because it’s less expensive and easier to care for than paint, it’s also practical for an active household. If you love the natural look of wood, stain is the way to go. By subtly enhancing the wood’s color and bringing out the texture of the grain and knot holes, stain makes the most of what’s already there. Stain is especially well suited to traditional or rustic decor styles, where the warmth and earthy tones of wood play a major role. In fact, although white kitchen cabinets have been the trend for two decades now, the time-honored charm of stained wood cabinets is coming back into style. On cabinets made from wood with a prominent grain, stain usually gives better results than paint. With stain, grain becomes an attractive feature instead of a flaw the paint failed to cover. Kitchens and baths are active, messy places so there’s a good chance your cabinets will show wear. Stain hides dirt, grease, and fingerprints more effectively than paint and it discolors less with time. It stands up to humidity better and is less prone to chipping and cracking around the cabinets’ joints. Your cabinets naturally expand and contract with changes in temperature and humidity, which can crack paint. Stain is absorbed into the wood itself, so it moves with the wood and won’t warp, peel or crack. Even nicks and dings are less visible on stained cabinets. Stain is easier to touch up in an inconspicuous way. Painted cabinets change color over time, so it’s hard to get an exact match even if you have a leftover bucket of the same paint. If your cabinets were painted by the manufacturer, many of which use industrial spray painting machines, a touch-up done with a brush won’t look as smooth. On stained cabinets, scratches and nicks are simple to cover with a putty crayon or stain marker. If you plan to finish your cabinets yourself, stain makes it easier to get professional results. Stain is more forgiving of mistakes such as uneven application and won’t show brushstrokes. Applying stain is often less work. Stain can look good after just one coat and some dense hardwoods, such as oak or maple, can only take a single coat. With paint, however, you might need several coats to get that smooth, modern finish. For both stain and paint, you’ll need to sand the cabinets and finish them with a protective topcoat, so there’s no difference in time and effort there. Stain generally costs around 10 to 15 percent less than paint. In a small room with 15 linear feet of cabinet space or less, the difference is negligible. The problem comes when you have a room with more than 30 linear feet of cabinet space. In this case, you could end up spending hundreds if not thousands more to paint your cabinets rather than stain them. The same goes if you’re buying new, finished cabinets because the manufacturer will pass the cost difference on to you. Combine that with the fact that painted cabinets also take more upkeep and you might find the cost of painting isn’t worth it. If you want total control over the color of your cabinets or if the ambiance you’re aiming for just won’t work with wood, paint is the way to go. Even if you plan to stick with a traditional color, but you have MDF cabinets, paint will give you more appealing results. If you have wood cabinets and want to show off their natural features, stain is the clear winner. It’s also a practical way to keep the cost and maintenance requirements of your cabinets down while still enjoying a luxury appearance.